When music fans on the Hawaiian Islands think of the biggest party of the year, only one name comes to mind: The MayJah RayJah. Over the last five years, the Mayjah Rayjah Music Festival has become a must see event for locals and visitors to Hawaii who find themselves as reggae connoisseurs. 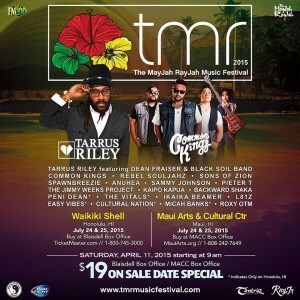 Following the 2014 edition, headlined by J Boog and Shaggy, the upcoming 2015 MayJah RayJah will feature Tarrus Riley from Jamaica, the Common Kings, Rebel Souljahz, and Anuhea from Hawaii, as well as Sons of Zion and Pieter T from New Zealand, and Sammy J from Australia, among many others. With a capacity crowd last year at the Waikiki Shell and Maui Arts and Cultural Center, even with one of the days hit with heavy rain, the fans still turned out and received far more than their money’s worth with the elite lineup assembled. Although, the fans’ money’s worth might not have been too deep in the pockets. The MayJah RayJah had a one-day sale on tickets, selling for $19, and the festival organizers are continuing that philosophy this year. MayJah RayJah tickets officially go on sale on April 11th, featuring the one-day special of $19 tickets. VIP passes and special packages for the multi-date, multi-venue festival are also available. Only a select number of tickets will be made available on April 11th at the discounted price, so be sure to mark your calendars and set your alarm clocks for 9AM Hawaii Standard Time. For more information follow the links below for the MayJah RayJah Music Festival.